Noble the Happy Kid is the seventh book in the Not So Serious Jack series, written in rhyme by Jack Thompsen (aka: Not So Serious Jack) and illustrated by Ignacio G. Noble is a happy boy who loves to exercise, play with his dog and cook food for his parents. When he has a mishap on his bike, Noble knows his father will know what to do. After he fell down while running, his mother makes him feel better. But when Noble’s dog, Blue, is despondent and does not want to play, Noble quickly jumps into action, leading to a visit to the vet, who is impressed by Noble’s keen observation skills. The following day leaves Noble sad and worried, but he knows that it is okay to feel sad sometimes, and that talking to friends and family always helps. 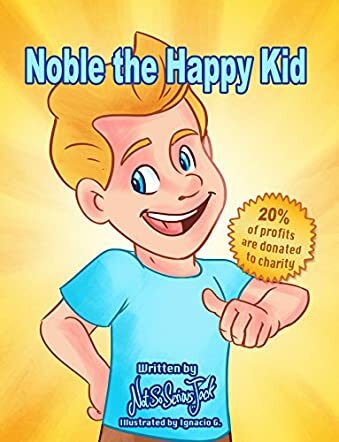 Although Noble the Happy Kid is geared towards younger audiences, I could not help but be impressed by the extremely important message which is conveyed to its readers. Jack’s tale of a young boy who has a network of friends, both inside and outside of his family circle, teaches children that they never need feel alone in the world. Instead of bottling up feelings of being scared or sad, it is sometimes good to talk to people who care and who are interested in what is going on. Bottling up sad and scared feelings leads to bigger, more in-depth problems later in life and causes stress and anxiety, which might not go away. I wish I had read a book such as Noble the Happy Kid when I was much younger, as keeping my scary feelings locked inside led to much damage over the years. Important messages such as this (ensuring that your child knows that they are never alone and can talk to you about anything) is one of the most important things that a child needs to learn. I very much enjoyed reading Noble the Happy Kid and wholeheartedly recommend it to children and parents alike, so that they can build on the love and trust that parents and children need in order to have an emotionally healthy and happy tomorrow.